Ben Cohen came to prominence in the successful Northampton side that lifted the Heineken Cup in 2000. A big, quick wing, his try-scoring ability brought him to the attention of England boss Clive Woodward, who handed him an international debut against Ireland during the 2000 Six Nations. Cohen became a regular fixture of the England side under Woodward and became a prolific try-scorer on the international stage. He is behind only Rory Underwood on the scoring charts and toured with the British & Irish Lions to Australia in 2001. He started six games at the Rugby World Cup in 2003, receiving a winners medal and MBE after winning the tournament against hosts Australia. At domestic level he left the Saints in 2007 following their relegation from the Premiership and the appointment of Kiwi Bruce Reihana as skipper. 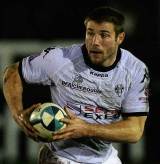 He joined French Top 14 club Brive alongside fellow England internationals Steve Thompson and Andy Goode, but endured mixed fortunes in the Top 14. In 2009 he returned to the Premiership with Sale Sharks, scoring a try for his new club against Toulouse in the Heineken Cup. After two solid seasons with Sale, during which he played 37 games for the Sharks and scored eight tries, he was surprisingly released from at the end of the 2011 season having just picked up the club's player of the season award. There was interest from clubs in England and France, but Cohen took the opportunity to announce his retirement from the game at the age of 32 having scored 31 tries in 57 international matches for England.